Downtown Phoenix Zombie Homecoming - 10/4/2013 - Zombiewalk.com - Your source for all Zombie Walk and Zombie Flash Mob planning! Prepare yourselves: Zombies are coming to Downtown Phoenix a little early this year. Before they swarm our city streets for Zombie Walk 5 later in October, they’re swinging by The Duce on Friday, Oct. 4 for the first Zombie Homecoming—and you’re invited. 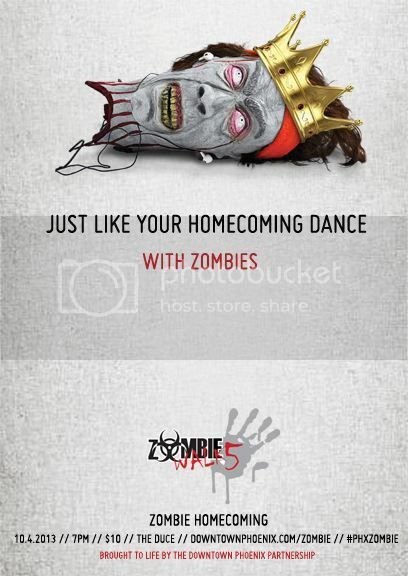 The party begins at 7 p.m., and features the crowning of the Zombie Walk 5 King and Queen, as well as homecoming classics like punch, snacks, and a photo booth in an undead replica of a high school dance—but with booze. Sip on any of The Duce’s famous cocktails while you watch the season-three winner of SyFy’s Face Off Nicole Chilelli make over John Holmberg, the host of KUPD’s Morning Sickness. Tickets are $10, but use promo code PHXZOMBIE and receive $2 off regular admission pricing. Hurry, though, the code expires Sept. 27. Admission includes entertainment, finger foods and zombie drinks. The Arizona Ghostbusters and Ecto-AZ will be on hand for photos and to collect food donations for St. Mary's Food Bank. For more information, visit www.downtownphoenix.com/zombie. Last edited by jettajeffro; 09-19-2013 at 05:49 PM.